Visby is the largest city on the Swedish island of Gotland; it is arguably the best-preserved medieval town in Scandinavia, and in 1995 became a Unesco World Heritage Site. Visby Golf Club at Kronholmen celebrated its first fifty years of club history in 2008 and the club remains an extremely popular golf destination. A combination of seaside and parkland holes ensures that visitors and locals alike remember Visby fondly. This is a demanding course with many hazards, none more obvious than the strong wind from the Baltic Sea. Nils Sköld designed the original course in 1958, and Peter Nordwall performed further upgrades in the 1990s. 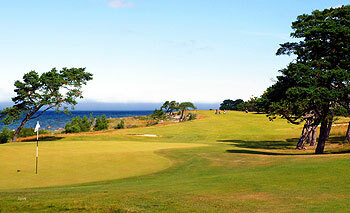 In 2007, former Ryder Cup player Pierre Fulke teamed up with Adam Mednick to renovate Visby and work completed in 2009. Maybe renovation is a misnomer, all tees, bunkers and greens are new, the routing is new, and two new holes were added, however careful consideration was taken to preserve the legacy of Skiöld and Nordwall’s work. Special mention goes to the new 6th, a fine par five along the water’s edge that requires careful consideration and flawless execution. We can imagine that many a picture will be taken from the green looking back at the fairway and the fabulous sea view. If you take the time and trouble to travel this far to golf, then you must also play the short 9-hole course belonging to the club, preferably before tackling the championship 18 holes. ​As a member at Visby, I have, as I write this, played the course 435 times since it was reopened after the rebuild in 2009.​ It is nothing short of FANTASTIC, and offers new challenges every day pending wind, weather and flag placement on the greens. You will truly enjoy the layout of the course, the fantastic views and the great conditions this course always offers. It is by far my favorite course in Sweden, and I never get tired of playing here when I visit Gotland. If there is such a thing as a 100% satisfaction guarantee, this is definitely one of them! Oh, and the nine-hole course is great too! Visby's first nine holes are by far and away the most beautiful in Sweden and unless raw power and course length are your first requirements, I would also venture that they are the best!The back nine also starts along the coast-line towards Västergarn, but some tricky, but charming holes in the coastal pine forest (the original design of Nils Sköld no doubt...) follow on holes 12-16 until you are faced with the tee-shot out towards the Baltic on the par-three 17, which can be anything from a driver to a wedge, dependent on the wind. The finishing hole is also fantastic, so you will leave this place with a smile on your face, even if the scorecard does not tell the same story.To score well you will probably need many rounds to learn where to place your shots and a benign day, weather-wise. That is, unless you are visiting from Ireland or Scotland.If you do, you will neither be disappointed, nor feel out of place.The green-fee is a steal, even the SEK 700 top rate. Visby has that mysterious quality, you simply know that you have played a great course, you may not know exactly why, but, when you start your recap of the round you discover that you have been sternly tested, and you have enjoyed every single moment of it. Firstly there is the location, on the seaside with magnificent views of Karlsöarna, far from any major roads or cities, there’s the sea and the golf in a wonderful tranquil setting. Then there is the course itself, a few seaside holes, and some forest holes, mind you, this is seaside forest so it is quite open, and on those days (almost always) when there is a bit of wind dont expect any particular respite from the trees. Hole by hole, each presents a different challenge, creating a enjoyable rythm to the round. From the opening medium par three, then the fabulous short par five 6th along the sea. The short but wonderfully tricky 11th, guarded both by water on both sides and some well placed fairway and greenbunkers, thru to the wonderful approach of the par five 16th, the sea in the distance beautifully framed by leaning trees and a small brook bisecting the fairway in front of the green. When you walk off the majestic par five 18th, I am pretty sure you will be thinking “can I have another round, please?” I can only fully agree with the previous reviewer, this is a course that deserve stardom. What a place for golf ! I played there last friday 9th, on a quite windy day and tons of sunshine. Last time I was there 25 years ago It was a great place. Now it´s even greater.This is perhaps not the best known course in Sweden, but it should be. Firstly there are the superb views over a sweet coastline, the sea. At first site it can be intimidating, but keep on and you will be rewarded. Course maintenance is of very high standard and the greens are slick and firm, as it should be. But you have to bring your best game, otherwise this course knock you down.You sometimes, wonder why some courses never reach the sort of stardom they might deserve. Well here is one of those courses. Over the past two years the 27 holes has been redesigned by swedish Ryder Cup player Pierre Fulke and Adam Mednick. The course has significantly improved! Better greens. Better bunkering. Better routing. More interesting design overall. And sea views from every hole.